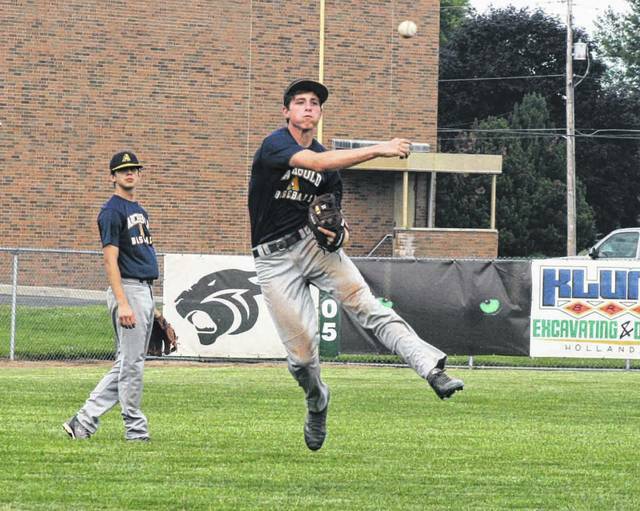 Archbold third baseman Clay Nafziger throws out a Delta base runner during an ACME baseball game Tuesday. The Bluestreaks bested the Panthers 17-1 in five innings. 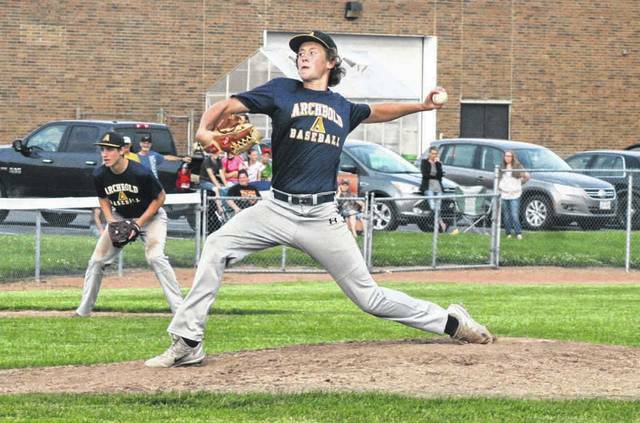 Aiden Warncke of Archbold pitches against Delta Tuesday. He went the final two innings, recording five strikeouts in that span. 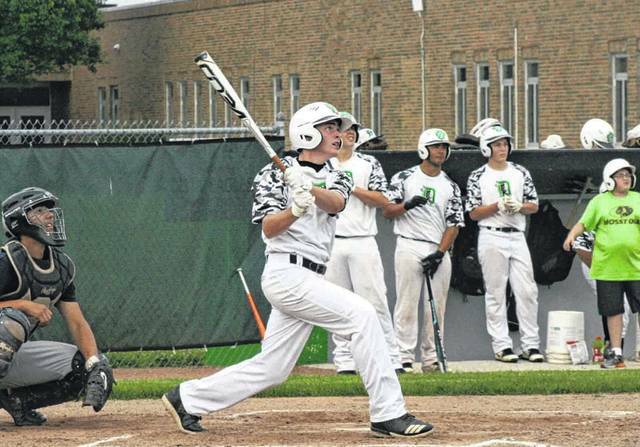 Delta’s Hunter Hamilton smacks a double to right center in the bottom of the second inning. Tristan Saeger of Delta lifts a ball to center field, scoring a run on a sacrifice fly in the bottom of the second. Archbold exploded for a total of 15 runs combined in the fourth and fifth innings, turning a one-run game into a 17-1 throttling of Delta in ACME baseball Thursday at Jim Harmon Field. The Bluestreaks grabbed the lead in the top of the first inning. Jeron Williams led off the game with a double, then later scored on a fly ball off the bat of Mitch Grosjean. Delta would respond, but not until their second at bat. They also got on the board by way of the sacrifice fly, as Tristan Saeger sent one to center field scoring Hunter Hamilton, knotting the game 1-1. The Streaks continued the trend in the top of the third. After Clay Nafziger belted a one-out triple to left center, Chase Kohler’s flyout to left scored him to break the tie. 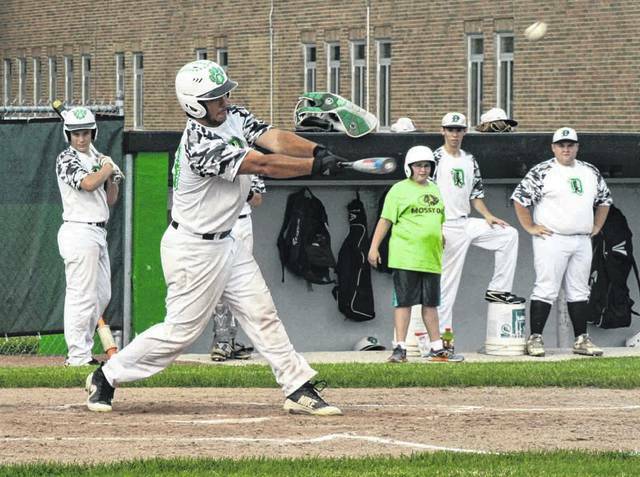 It then got out of hand for the Panthers in the top of the fourth when the Streaks banged out eight runs on seven hits. Delta also committed three errors in the frame and had five on the night. With runners on first and second, Archbold made it 4-1 on a base hit from Holden Galvan in which he advanced to second when the ball skipped past the center fielder. After a flyout Travis Ziegler singled home Galvan, moved to second on a wild pitch during Nafziger’s at bat, then Nafziger reached on an error. Kohler followed with a run-scoring single to make it 6-1. A hit by pitch to Williams loaded the bases, then T.J. Rice, Grosjean and Drake Mohring each singled in runs to put the margin at 10-1. Grosjean’s was the big blow, a two-run single to left. Archbold slammed the door shut in the fifth inning where they added seven more runs. Williams, Rice and Erbskorn each had run-scoring hits in the frame, with Rice’s being a two-run double. Kreighton Sims got the start on the mound for the Streaks, going three innings to get the win. Aiden Warncke went the final two innings, recording five of the six outs via strikeout. Hamilton went 3 2/3 innings for the Panthers in taking the loss. Austin Michaels and Kayden Kurth completed the outing.